oh yeah, and happy April fool’s day! Monday: Start the week off with some Interactive Interactions – learn about everything from apps to cms schooling to what might be the next big thing with our special guests from Fast Armadillo, Envision Interactive, MODx, Thinq and ExtraSauce. Tuesday: We lay tribute to DFW Women In Design – complimented by a ladies (and gentlemen) lunch, a gallery exhibit and talks by Debbie Millman and Bryony Gomez. Wednesday: Celebrate and learn from DFW’s Leading Creatives, with a talk from Wayne Geyer, and an intriguing CD Panel with Jeff Breazeale, Liz Burnett, Albert Cano, Matt Jones and Brandon Murphy, followed by AIGADFW’s Creative 20/20 night. Thursday: Declare Your Independence (or at least entertain the idea) with a Free Agent panel led by Steve Stafford and our Work/Life balance talk by Ben Jenkins. We add a nightcap to Thursday’s events with the first annual DFW MIX – a creative resource tradeshow. Friday/Saturday: End the week with some Good Inspiration with our Design For Good lunch brainstorm workshop, a visit with Doug Powell, AIGA’s national President and an awards dinner celebrating one of Dallas’s best leading designers. 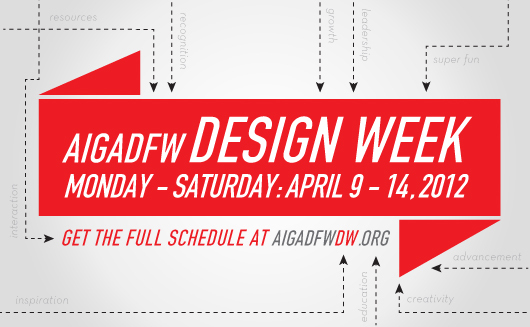 AIGADFW Design Week is North Texas’s premier design conference for professionals and students with the aims of further promoting thinking about and demonstrating the value of our craft, and empowering the success of DFW’s design, advertising and interactive businesses and individuals. AIGA’s mission is to advance designing as a professional craft, strategic tool and vital cultural force. During Valerie Powell’s visit she spoke to the advanced digital media class about artist residencies. It is a great opportunity when you are young and can afford the time. Especially after you graduate, you will understand the appeal of having that much free time and seclusion to make good work. The University of North Texas will be hosting the annual Lone Star Graduate Diversity Colloquium on March 30-31, 2012. The purpose of the event is to encourage groups from diverse backgrounds, including underrepresented and first-generation college students, to attend graduate school in Texas; however, anyone interested in attending graduate school is welcome. Tarleton’s Office of Diversity and Inclusion is interested in taking a group of interested students, staff, and/or faculty to the Friday part of the colloquium. On March 30,a group will leave in the morning and arrive back in Stephenville in the evening. If you are interested contact Dr. Moumin Quazi at quazi@tarleton.edu. Please, contact me via email at your earliest convenience, to let me know if you’re interested in driving together with me, at Quazi@tarleton.edu. Art 382 will be meeting at 11:30 on Thursday 4/5 to drive to Fort Worth and visit the studio of artist Vernon Fisher. Any other interested students are welcome to come. His studio is at 1109 North Main St and we should be there by 1pm. Vernon Fisher is an internationally known artist who most recently had a career retrospective at the Fort Worth Modern in 2011. His work combines painting and drawing with photographs and text to create images that suggest ambiguous meanings. See more of his work here. This is an enormous opportunity for art majors, please contact any of the art faculty if you are interested in attending. The 2012 annual SIGGRAPH (Los Angeles, August 5-9) conference is the premier gathering of industry professionals who work with arts in an electronic and digital manner. This is a great opportunity to apply for funding to get free admission to what is normally an expensive conference to attend. Are you science? Are you art? Do you daydream of computations or calculate in creativity? If so, you will find yourself right at home at SIGGRAPH 2012. Science and art will come together in one outstanding international conference to explore computer graphics and interactive techniques from both points of view, and YOU can be a part of it! You can be SIGGRAPH 2012! The SIGGRAPH 2012 Student Volunteer Program wants to put you in a red vest with the network of students who support the conference and give you the opportunity to meet and learn from industry professionals, creators, educators, visionaries, and each other. As a Student Volunteer, you will form relationships with other students that will last for your entire career. The industry’s future leaders are encouraged to apply: students who demonstrate leadership, service, and a passion for computer graphics and interactive techniques. Benefits of being a Student Volunteer include free full admission to the complete SIGGRAPH 2012 program. This includes Courses, Talks, Technical Papers, Panels, the Reception, and much more. In addition, the benefits of being a Student Volunteer extend beyond the conference schedule to professional development and private Student Volunteer Special Sessions with top professionals who were once Student Volunteers themselves. All of this is available to high school, undergraduate, and graduate students who are enrolled full time for at least one semester during the 2011-2012 academic year and are at least 18 years of age. Students can apply to volunteer for either 18 or 30 hours (approximately) during the conference. Volunteers who are willing to commit for at least 30 hours are eligible to apply for Travel Assistance Awards, which offer financial help for travel to and from the conference. Also, extraordinary 30-hour applicants who live outside the Los Angeles area may be selected to receive complimentary housing during the conference. The Long Beach Island Foundation of the Arts and Sciences (LBIF) encourages emerging artists as well as those with established reputations to participate in the National Juried Competition: Digital Works. The purpose of the exhibition is to showcase works that are created through digital processes, display distinctive characteristics of the digital, and reflect on the language and aesthetics of digital media (such as new forms of image creation and manipulation, connectivity, or participatory and generative qualities). Submissions may include all forms of digital media (photography/prints, video, software art, online and mobile projects, etc.) and must have been executed since 2008. Deadline is April 7th. Juror: Christiane Paul, Director of Media Studies Graduate Programs, The New School, NYC and Adjunct Curator of New Media Arts at the Whitney Museum of American Art.